Productivity Scientific GTD Timer is the World's first software countdown timer entirely focused on Getting Things Done approach. It is created with excellent ergonomics, perfect design and simplicity in mind. Why I Need This Software? GTD Two Minute rule: If the Next Action can be done in 2 minutes or less, do it when you first pick the item up. Even if that item is not a "high priority", because it takes longer to store and track any item than to deal with it the first time its in your head. We were not the first who made software countdown timer, but we we first who created such application entirely focused on Getting Things Done approach. 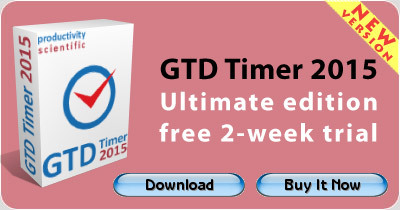 Currently Productivity Scientific GTD Timer is the World's best software timer focused entirely on Getting Things Done. Configurable to play "ticking sound"
06/30/2014 - GTD Timer 2015. Introducing Time Report feature. See complete list of new features.